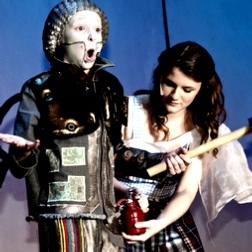 BTEC Level 3 National in Performing Arts is an exciting course that allows students to develop their understanding of theatre and performance in a practical and theoretical way. There is a focus on practical aspects of theatre which is supported by the theory behind it. BTEC Level 3 Nationals are vocational qualifications designed to promote success and achievement whilst stretching students to be independent which we believe are skills that will set our students up for life. The course requires students to work independently and as part of a collaborative theatre company, developing skills that are transferable to a range of situations and careers. The course has been developed in collaboration with over 5,000 universities, employers and professional bodies with employability at the heart. Students will develop the skills and confidence they will need to take ownership of their future with qualifications that will support their development on their chosen pathway. There are a combination of assessment styles allowing students to demonstrate their knowledge, skills and understanding through work-related contexts and give them the experience needed to succeed in life after 6th form. Students investigate the work of performing arts practitioners and develop critical analysis skills and contextual understanding of how practitioners communicate themes in their work. Practical & written exploration of the work of practitioners prepares the students for the final written assessment. (Internally set and assessed, externally sampled). Students explore technical performance skills with a focus on developing skills and techniques in at least two performance styles, assessment of both practical and written work creates the overall mark for the unit. Students explore and integrate creative, physical and vocal skills and techniques, working collaboratively to create a performance in response to a given stimulus. Assessment of both practical and written work creates the overall mark for the unit. Students develop acting methods by exploring different acting styles. They will apply techniques to the development, rehearsal and performance of their practical work. On-going assessment of both practical and written work creates the overall mark for the unit.